Local 40 of the United Steelworkers will on Monday review and vote on a contract offer from Special Metals. "I’ve received word there is a proposal from Special Metals for the USWA Local 40 members to review and vote on tomorrow. That’s real progress !! Thank you friends, community and elected officials who came forward to offer support. You all have been amazing." 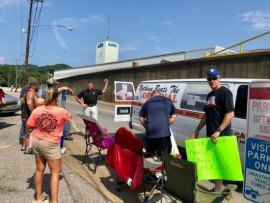 On Sunday various state representatives visited the workers holding a picket outside the plant, Caserta said. "A delegation of elected officials from the House of Delegates and others held a prayer vigil at 2:30 p.m. for a quick resolution so workers return to work. I think it’s great how the community and elected officials from both aisles are reaching out." Special Metals sent workers home Friday afternoon and put the plant in suspended operation, pending resolution of the union contract.